Windows 10 is just out, and deeper integration with Microsoft’s latest OS is high on the list of new features. This extends to the ability to run Cortana, Microsoft’s digital personal assistant, as an always-on feature within the Mac environment. “Siri is not on the Mac, [so] we thought it would be great to bring you Cortana," said Parallels communications veep John Uppendahl. This includes the ability to yell “Hey Cortana” at your Parallels-enhanced Mac and have her respond, though honesty compels us to say that this feature failed utterly in our brief press demo. That said, we did see Cortana start Google Chrome Mac through voice control, showing the depth of the integration. Cortana is an eye-catching feature, but perhaps of more practical use is the appearance of the Windows 10 Action Center, including notifications, as an item in the Mac menu bar. Click it, and the Action Pane slides into view on the Mac desktop. These features require Parallels to be running in Coherence mode, in which the Windows desktop is hidden from view and apps running on Windows appear on the Mac desktop. There is also an option for keeping Windows firmly within its own application window. Other features include access to Mac location services from within Windows, Mac “Quick Look” previews for Windows documents, and menus for Windows applications in the Dock including recent files and “New item” shortcuts. You can also now synchronise audio volume between Mac and Parallels VMs, and print to Mac printers from within Windows. Parallels claims up to 50 per cent faster Windows boot time in the new release, up to 25 per cent more battery life, and up to 20 per cent faster performance in the VM, as well as 5 per cent faster file transfer between Mac and Windows environments. A new Travel Mode shuts down power-hungry VM services automatically when on battery power. 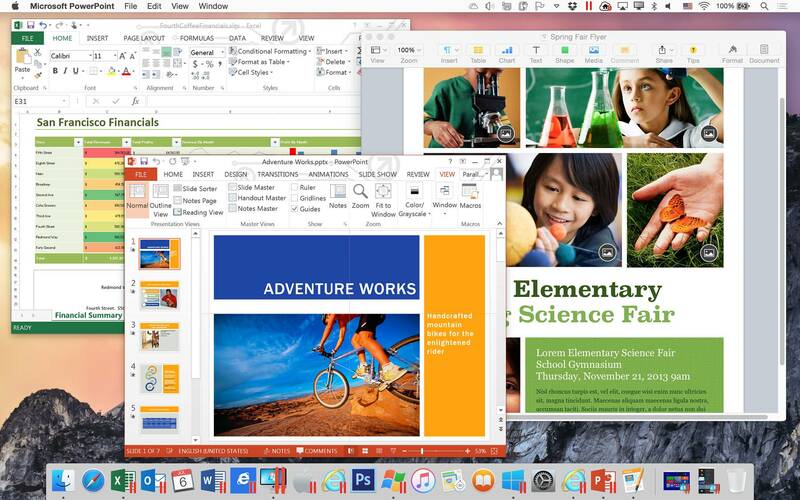 Parallels Desktop 11 has “experimental” support for Apple’s OSX 10.11 El Capitan, currently in beta with full release expected in the autumn. The product will be updated with full support when El Capitan is released. Support extends to running El Capitan within Parallels as well as running Parallels itself on the new version of OS X. There is also a new Parallels Desktop Pro edition aimed at developers and power users. This adds features including integration with Docker, Visual Studio, Chef and Jenkins. There is a guest OS debugger which you can use from Visual Studio, and support for virtual networks. Parallels Desktop for Business is a third variant of the product, ands adds Pro features as well as support for centralised management and deployment. You can use single key licensing across many installations and integrate with Microsoft’s System Center. The Pro and Business editions are only available on subscription. “That’s a great benefit because [users] don’t have to worry about being current," said Uppendahl, though such moves tend to be controversial, with some preferring to control when and if they upgrade without the annoyance of an expiring product. Parallels Desktop 11 costs £64.99 ($79.99), while the Pro and Business editions are £69.99 ($99.99) per year.